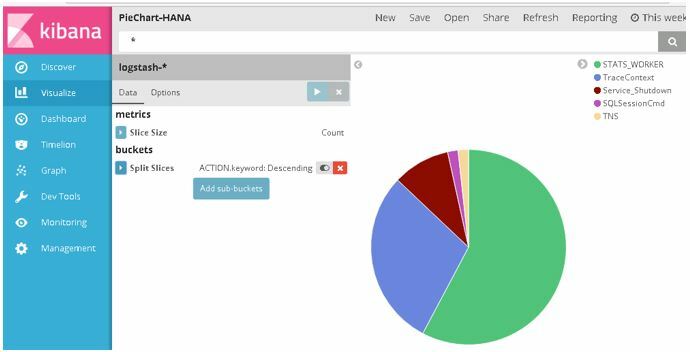 The blog explores an open source tool to monitor HANA logs in real time. Imagine having to monitor and analyse HANA logs to ensure your HANA node is running properly and what if you had many HANA nodes in a cluster environment in your landscape. SAP has introduced SAP ITOA which is a real-time monitoring and analysis tool which is a licensed version which runs on a HANA database, which grabs syslog from different infrastructure components. What if we could have an open source platform to stream, analysis and monitor your HANA component logs from HANA cluster nodes? We attempt to introduce a new analytics solution for real time log analysis “Open Stack IT operation analytics” for HANA cluster nodes which is developed in-house with open source tools (ELK stack) to stream, analysis, monitor SAP HANA components. Benefits of Open Stack IT operation analytics: Stream, analyse the logs and identify critical incidents in real time. 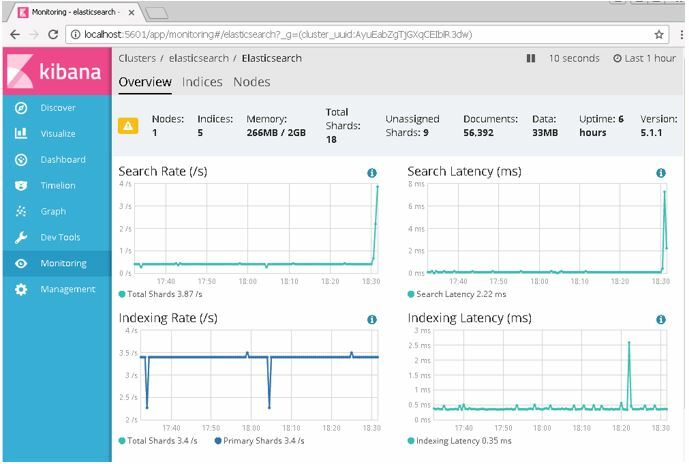 Elastic has created an end-to-end stack called ELK and elastic stack makes searching and analysing of data easier than ever before. Figure-1 represents the ELK stack. 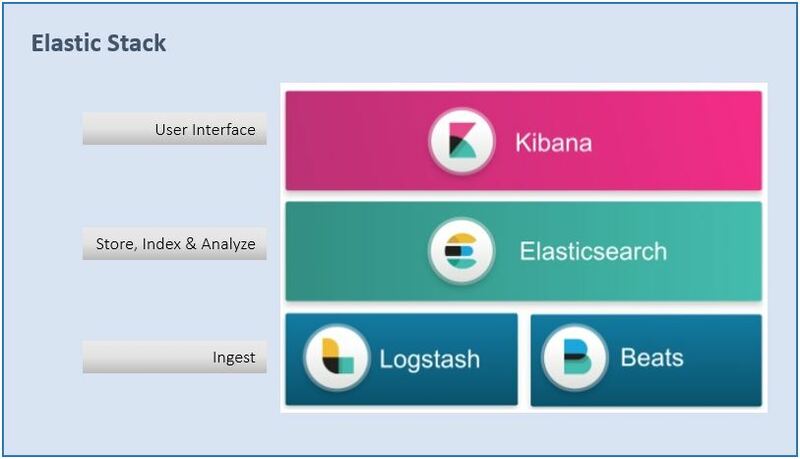 Kibana: Kabana gives shape to your data and is the extensible user interface for configuring and managing all aspects of the Elastic Stack. Elastic search: Elastic search is a distributed, JSON-based search and analytics engine designed for horizontal scalability, maximum reliability, and easy management. With elastic search we can instantly store, search and analyse the data. Logstash: Ingest any data, from any source, in any format. Logstash is a dynamic data collection pipeline with an extensible plugin ecosystem and strong Elastic search synergy. Ease overall processing independent of the data source, format, or schema. SAP HANA has below core components which availability is critical to the business. 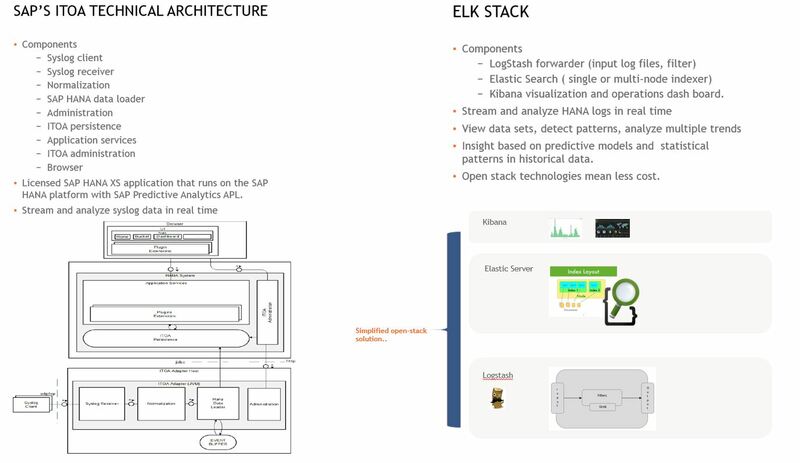 We can configure the ELK stack packages in any machine, in this session , we have installed and configured ELK in windows and shipped the HANA logs from our HANA box in cloud to the windows server (ELK). In this example we use the default index which has created , optionally you can create an index in the elastic search . The actual configuration file consists of three sections: input, filter and output. The input part defines the logs to read, the filter part defines the filter to be applied to the input and the output part specifies where to write the result to. Logstash comes out of the box with everything it takes to read Apache logs, syslog’s. 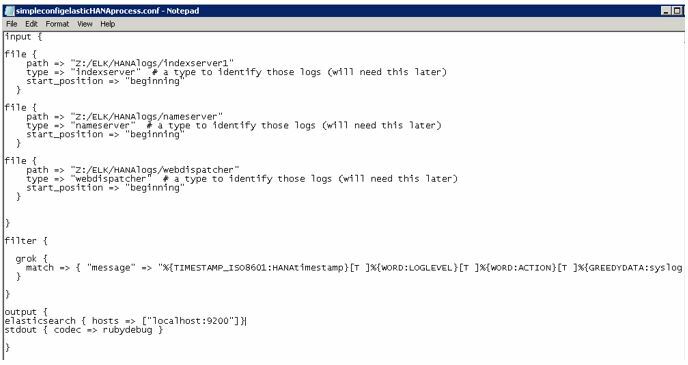 In case of SAP HANA components logs we need to derive custom pattern to read the logs. To do this we have used Grok. If you need help building patterns to match your logs, you will find the http://grokdebug.herokuapp.com and http://grokconstructor.appspot.com/ applications quite useful! All files starting with “indexserver_” at the directory are being read by logstash. To all lines read a type is added, which can be used later for searching and filtering purposes. The filter is applied to all lines with type which is mentioned in the input. Grok is doing the regular expressions and to find the customized patterns for HANA logs.To facilitate later analysis we have included timestamp from the log , action and the log message. 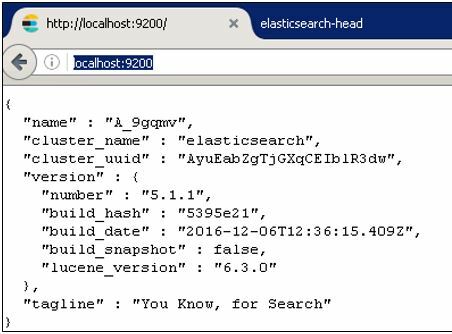 As output a local elasticsearch server is defined. The logs are written to the default index . 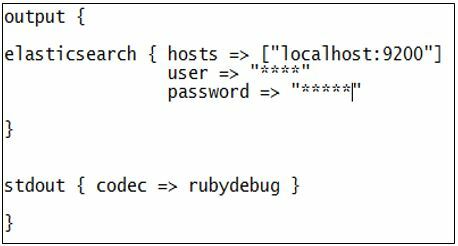 This stores the log lines as a value to elasticsearch and makes it accessible for further processing. 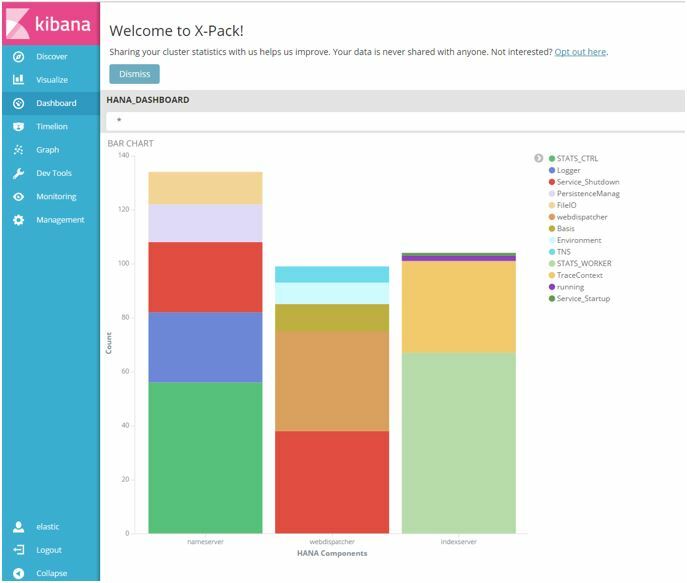 Open the Kibana interface and select the index pattern for which index the visualisation need to be created. Visualize your Elasticsearch data and navigate the Elastic Stack with different chart types. Alerting can be done based on the watcher search in Kibana which could send alerts in case of the critical errors , which will be discussed in the blog monitoring and alerting on critical errors of SAP HANA components in real time with Open Stack IT Operation analytics using ELK Stack. Hi ! Thx for post! One question: Step 3 is missing. It’s a numeration error or really one step is missing in the article?